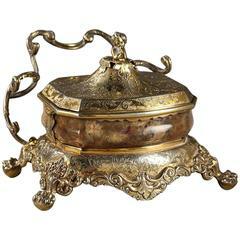 French Napoleon III oval-shaped inkwell. The inkstand is crafted in 18th century Sevres soft-paste porcelain, decorated with multicolored flowers in a white medallion ornate with golden foliage on a blue background regilded in the 19th century. Beautiful ormolu mounts of foliage scrolls with two handles on a pierced balustrade in Louis XV style. The plate has an ink bottle, two pen holes and a beaker. Resting on a fluted pedestal above four foliate legs. circa 1870 Dimensions: W 12,6 in - D 10,4in - H 6,7in. Dimensions: L 32cm, P26,5cm, H17cm. In overall good condition, with light wear to the gilding. An 18th century Sèvres cup and saucer with the S Sèvres makers mark. The cup features two exquisitely painted Romantic figures and a gold leaf inner rim.